October 11, 2018. 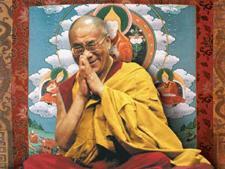 Thekchen Chöling, Dharamsala, HP, India – The happy chatter that filled the meeting room next to His Holiness the Dalai Lama’s office fell silent when he walked into the room and scanned the faces of the students waiting for him. He smiled broadly, wished them “Good morning”, and sat down. There were 51 students belonging to classes 11 and 12 from Woodstock School, who are visiting Dharamsala during their extra-curricular ‘activity week’. His Holiness first made friends with Woodstock School at the beginning of his life in exile when he lived in Mussoorie, the hill-station where the school is based. 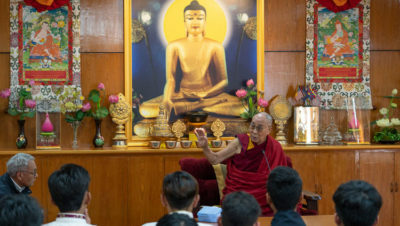 After asking how many Tibetans and Bhutanese there were in the group, His Holiness wanted to know where the rest of the students came from. The majority were Indian, but among a total of seven nationalities there were also students from Palestine, Syria and Afghanistan.